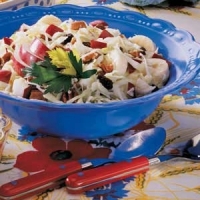 Combine cabbage, pineapple, pear, apple and grapes in bowl; toss to mix. Mix yogurt, vinegar, honey and celery seed in small bowl. Pour over cabbage	mixture; toss	to coat. Chill. Cover for 1 hour or longer. Add banana; toss lightly. Enjoy. Recipe categories: Lunch/snacks, Salads, Side dish.